At the gate to this world famous site in Karnataka South India we dodge touts, postcard salesmen, socks salesmen and fake tour guides. Then following a rough homemade sign, we twist our way through the crowds to the shoe check in. 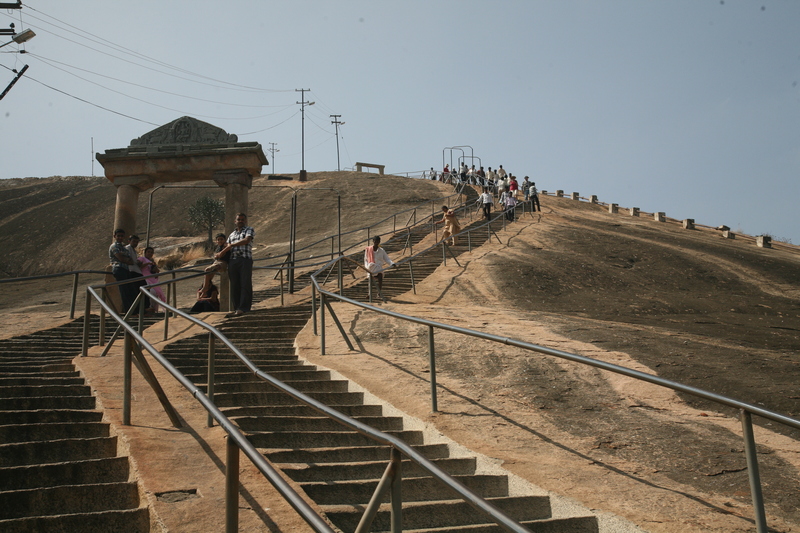 Like most religious sites in India shoes must be left outside the entrance, even in this case which, for me, includes a scary long flight of 700 steep stone stairs to climb. I will have to chill out my fear and simply imagine that the new socks I brought with me to India are hiking boots. Cutting through another welcoming party of hawkers and self-promoters we make our way through a simple gate and start to climb the granite stairs. The noon sun beats down and the sky, blue as though it were painted for a children’s story book, is unbroken by clouds. Colourful crowds of barefoot climbers––families with young children, large groups of school children, and a handful of European tourists––grab the sturdy railing alongside the stairs, and laughing and romping about, make their way up in a long line. “Take your time,” a French tourist says to me as I stop to rest and chat. 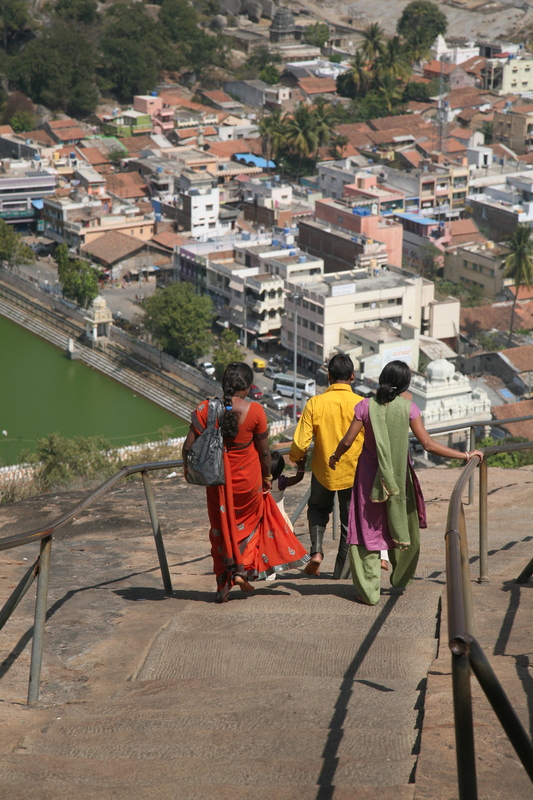 “You’ve got 600 more stairs to go.” Far below a checkerboard of green vegetable gardens, vineyards, coconut groves and fields of millet and corn glitters in the sun. It’s easy to pad up these ancient stone stairs one slow step at a time (we’ve had lot of stair practice this week visiting old forts and the World Heritage sites of Ajanta and Ellora even though I could usually wear my hiking shoes there.) Pad, pad, pad. I like the feel of rough-cut granite through my socks. The rhythm of my stepping up the stairs is mesmerizing and I’m brought into an ancient world I did not know about. Sravanabelagola, the town below, means monk of the white pond. 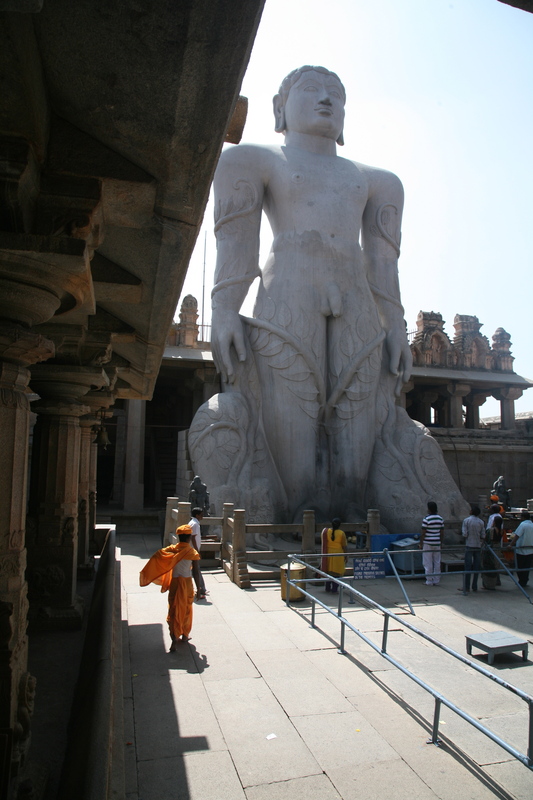 Towering above, serene and simple, the sculpture that represents the deity Bahubali, is a five story high monolith carved out of granite in 981A.D. 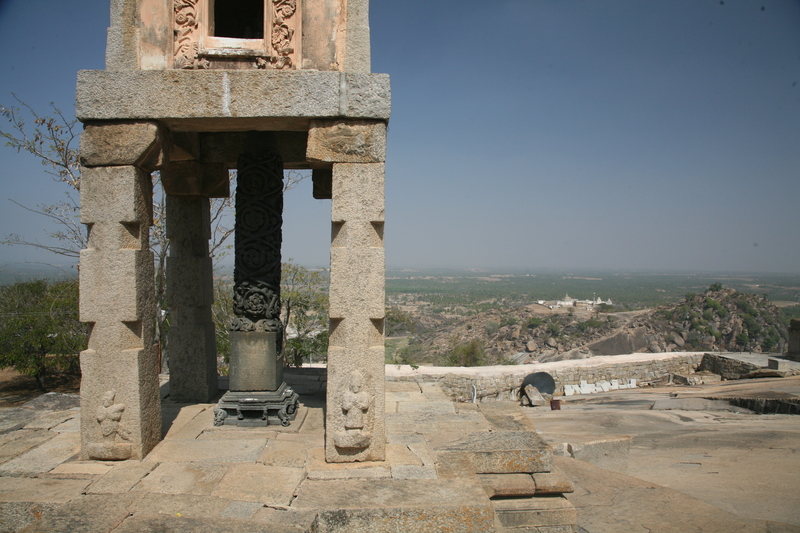 People of the Jain faith, (which was founded in the 6th century B.C. to deal with the constraints of caste in Hinduism) have been making pilgrimages to this site for over a thousand years. I can only imagine their thoughts as they plodded along up the stairs to work toward their goal of achieving complete purity. I reach the foot of the giant rock saint in an hour or so. For me it is not the faith that brings me here but the sight. I am living in history, surrounded by the lives those who have come to this place for inspiration. 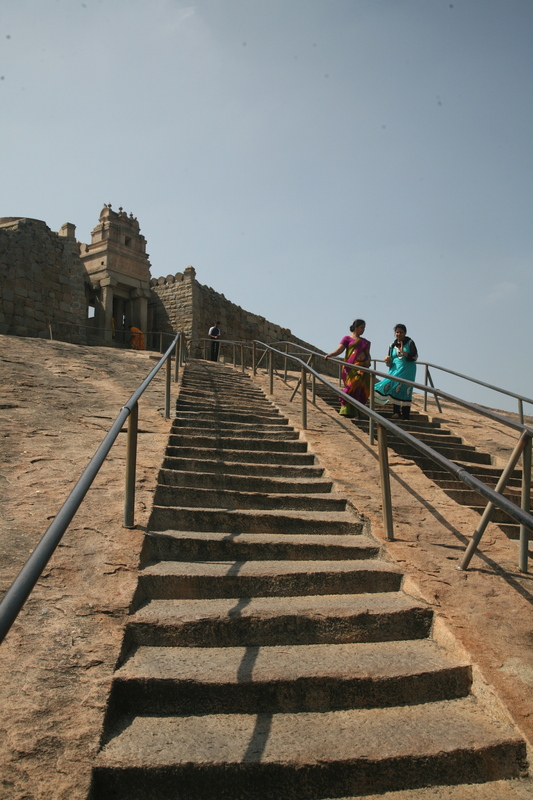 Slowly I pad back down the 700 granite steps, refreshed and enlightened. Even with my socks on. 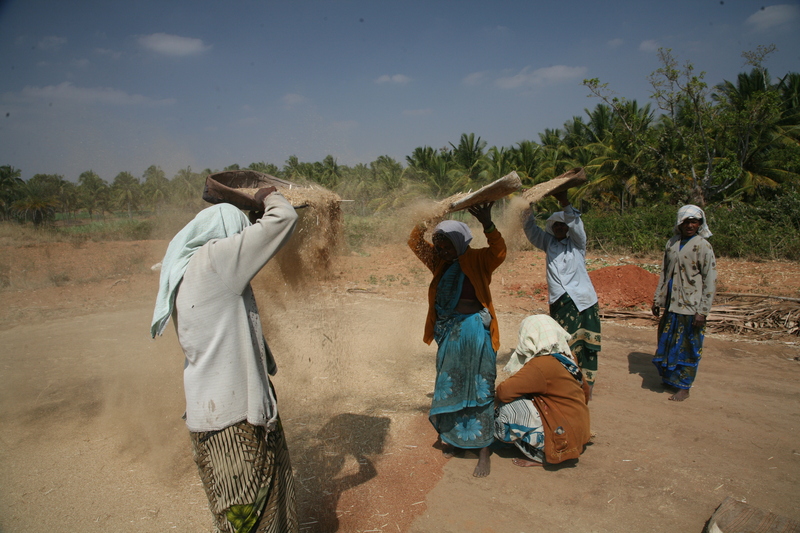 This entry was posted in India, Silk Road, Uncategorized and tagged travel, travel Bahubali. What a great story — you will need to frame your socks.